Boys Club logo created by Saul Bass from a national contest held in 1978. 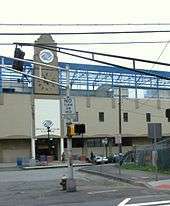 Pictured is the front of the building in Parkersburg, WV in which the Boys & Girls Club resides. Fred C. Church Jr., insurance businessman. ↑ "Mad._Sq_AR_FINAL_reference.pdf" (PDF). Boys & Girls Clubs- Madison Square. 17 Mar 2014. Retrieved 19 Apr 2014. ↑ "Home - Madison Square Boys & Girls Club" (PDF). 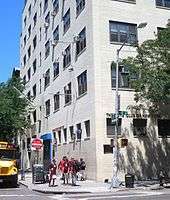 Madison Square Boys & Girls Club. 17 Mar 2014. Retrieved 19 Apr 2014. ↑ Boys & Girls Clubs of America, Boys & Girls Club Leadership University. "COREv2: History of the Boys & Girls Club." ↑ "MLB Community: Programs: Boys and Girls Clubs of America". MLB Advanced Media, L.P. 19 Jun 2012. Retrieved 19 Apr 2014. ↑ "Title 36 -- Patriotic Societies and Observances". US Congress via bulk.resource.org. 11 May 1994. Retrieved 19 Apr 2014. ↑ Great Futures Start Here. (n.d.). Retrieved June 3, 2013, from "Archived copy". Archived from the original on 2011-11-24. Retrieved 2011-11-14. ↑ Boys and Girls Club, Alumni Hall of Fame from "Archived copy". Archived from the original on 2015-12-30. Retrieved 2015-03-17.